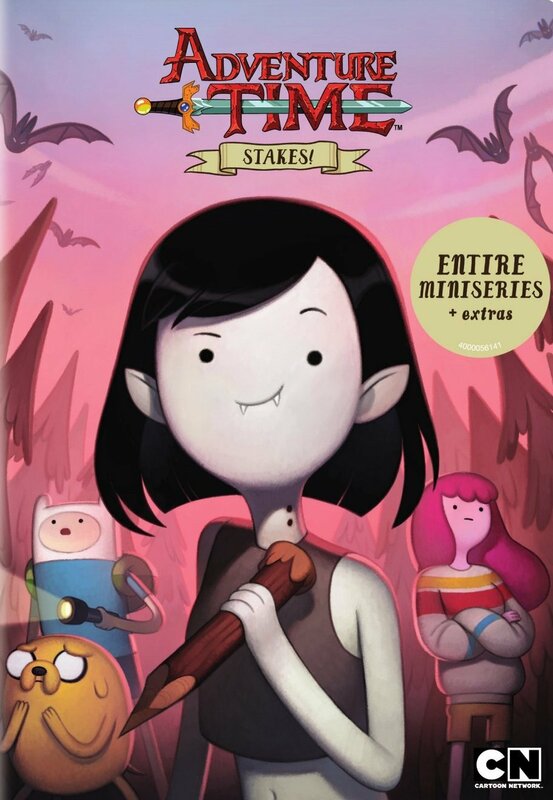 DVD Review: Adventure Time: Stakes! Adventure Time: Stakes! is another complication disc of Adventure Time episodes, but what makes this release stand out from the others is that all eight episodes on the disc form a mini-series, they're not just random episodes chosen from various seasons. The mini-series focuses on Marceline the Vampire Queen, a personal favorite character of mine, so I was eager to watch this. They even gave the mini-series a new opening sung by Olivia Olson who voices the character of Marceline. The story finds Marceline wanting to become human, so she enlists the help of the only person she believes succeed, Princess Bubblegum. Bubblegum is eager to help as we all know how much she love experimental procedures. Bubblegum extracts Marceline's vampiric essence, but it's still unclear as to whether or not the procedure worked as she has dreams that appear to have really happened in some form after she wakes. While everyone else is ready to convict Marceline right there, Finna and Jake launch an investigation. And what they eventually discover is major bad news! I loved how this mini-series delved into Marcelene's past at various ages. It showed her as a child when she was with Simon, the man that was transforming into the Ice King, and how he had to leave her to keep her safe. It showed her as a teen, meeting a new group of people who at first wanted to kill her but then became accepting and eventually friends. And it showed how she slowly gained her powers. This all gave me a deeper appreciation of the character and made me feel for her. There is real emotion in this mini-series, but there's also a good bit of humor as well. I actually laughed out loud at how Jake was describing the creatures he saw to Peppermint Butler who was attempting to draw them. There aren't as many laughs as other shows like The Amazing World of Gumball or Rick and Morty, but it's still funny and it's a bit more deep than those shows. Most Adventure Time compilation DVD releases don't include any extra features, but this one comes with animatics, song demos, and an art gallery. They aren't great extras to be sure, but at least it's something.